(1) On the demand of the applicant, his international application shall be the subject of an international preliminary examination as provided in the following provisions and the Regulations. (3) The demand for international preliminary examination shall be made separately from the international application. The demand shall contain the prescribed particulars and shall be in the prescribed language and form. (a) The demand shall be submitted to the competent International Preliminary Examining Authority referred to in Article 32. Applicants should submit the Demand and appropriate fees directly to the International Preliminary Examining Authority (IPEA) they desire to prepare the International Preliminary Examination Report. 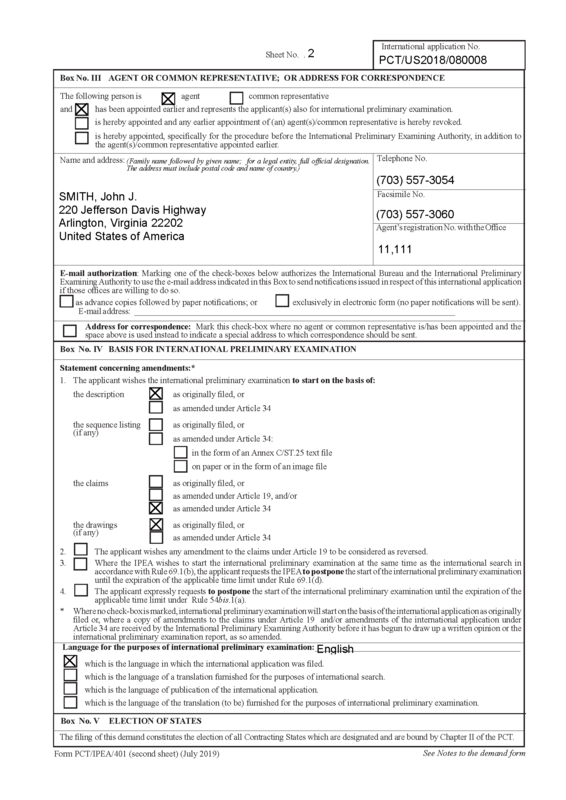 The demand must be filed prior to the expiration of whichever of the following periods expires later: (A) three months from the date of transmittal to the applicant of the international search report and the written opinion; or (B) 22 months from the priority date. Otherwise the demand shall be considered as if it had not been submitted and the International Preliminary Examining Authority shall so declare. See PCT Rule 54. In order to take advantage of a national phase entry time limit of at least 30 months from the priority date in relation to all States designated in the international application, it may be necessary to file a demand before the expiration of 19 months from the priority date. See MPEP § 1842, subsection VII.A. The IPEA/US will serve as International Preliminary Examining Authority for U.S. residents and nationals if the USPTO, EPO, KIPO, IP Australia, Rospatent, ILPO, JPO or IPOS served as the International Searching Authority (ISA) and the international application was filed in the U.S. receiving Office or the International Bureau as receiving Office. The IPEA/US will also serve as International Preliminary Examining Authority for residents or nationals of Bahrain, Barbados, Brazil, Chile, Dominican Republic, Egypt, Georgia, Guatemala, India, Israel, Mexico, New Zealand, Oman, Panama, Peru, the Philippines, Qatar, Saint Lucia, Saint Vincent and the Grenadines, South Africa, Thailand, and Trinidad and Tobago if the USPTO was the ISA. U.S. residents and nationals may also choose to have the international preliminary examination done by KIPO or Rospatent if the USPTO, EPO, KIPO, IP Australia, Rospatent, ILPO, JPO, or IPOS served as the ISA. U.S. residents and nationals may choose to have the international preliminary examination done by the EPO if the EPO served as the ISA. U.S. residents and nationals may choose to have the international preliminary examination done by IP Australia if IP Australia served as the ISA and IP Australia has not received more than 250 international applications from the USPTO during the fiscal quarter. U.S. residents and nationals may choose to have the international preliminary examination done by ILPO if ILPO served as the ISA. ILPO has certain restrictions of competency as an IPEA based upon the subject matter of the application. U.S. residents and nationals may choose to have the international preliminary examination done by the JPO if the JPO served as the ISA. U.S. residents and nationals may choose to have the international preliminary examination done by the IPOS if the IPOS served as the ISA. Information regarding the demand filing with the specific IPEA is available on the PCT Applicant’s Guide at WIPO’s website (www.wipo.int/pct/en/appguide/ ). 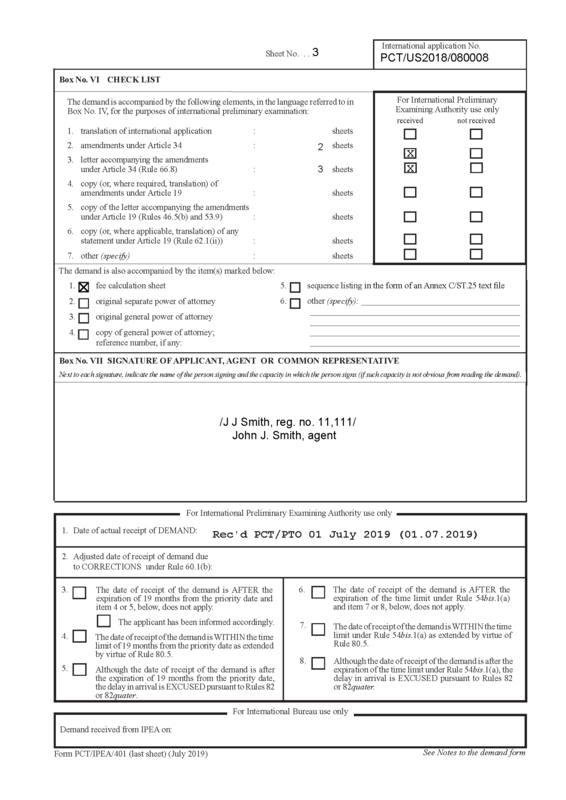 Demands filed in the United States Patent and Trademark Office (USPTO) should preferably be filed via USPTO's electronic filing system (EFS-Web) by registered e-filers in an application filed with the U.S. receiving office or searched by the USPTO. Filers who are not registered users of EFS-Web must file the demand by another acceptable method. To avoid unnecessary work and communication by the USPTO, applicants should not file a courtesy copy of a Demand with the USPTO, because the U.S. International Preliminary Examining Authority will process the Demand. If the USPTO is not a competent IPEA, the demand will be forwarded to the IB. The Priority Mail Express® provisions of 37 CFR 1.10 may be used to file a Demand under Chapter II in the USPTO. 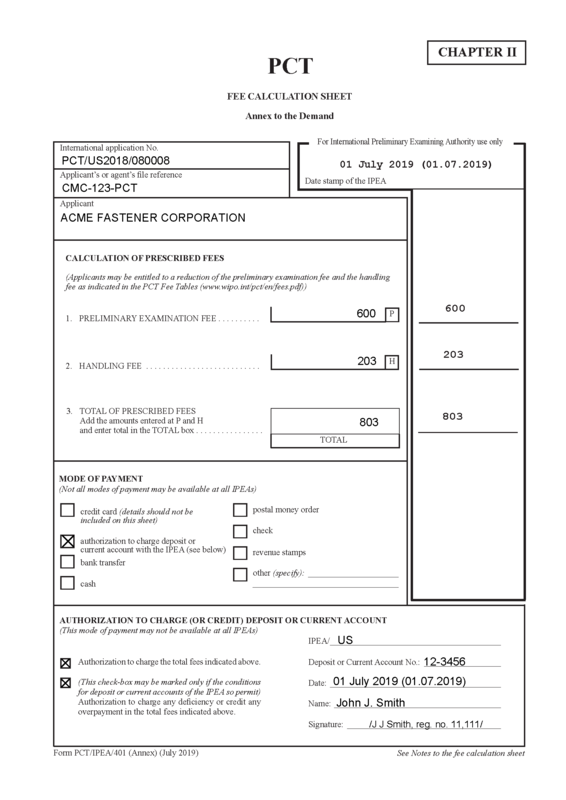 Applicants are advised that failure to comply with the provisions of 37 CFR 1.10 will result in the paper or fee being accorded the date of receipt and not the date of deposit. See MPEP § 513. Demand for international preliminary examination may also be submitted to the USPTO via facsimile. The Certificate of Mailing or Transmission practice under 37 CFR 1.8 CANNOT be used to file a Demand if the date of deposit is desired. 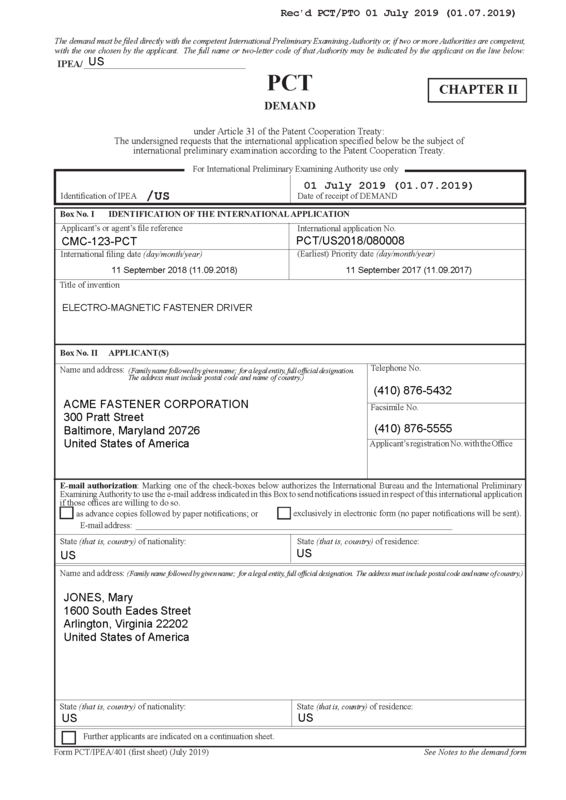 If used, the date of the Demand will be the date of receipt in the USPTO. See MPEP §§ 513, 1834, and 1834.01. All Demands filed in the USPTO must be in the English language. PCT Rule 59.3 provides a safeguard in the case of a Demand filed with an International Preliminary Examining Authority which is not competent for the international preliminary examination of a particular international application. The USPTO will forward such a Demand to the International Bureau and the International Bureau will forward the Demand to a competent International Preliminary Examining Authority pursuant to PCT Rule 59.3(c). The competent International Preliminary Examining Authority will process the Demand based on the date of receipt in the USPTO. See 37 CFR 1.416(c)(2).